The popular beach resort of Fuengirola is nestled between Torremolinos and Marbella on Spain’s sunshine coast, the Costa del Sol. Famous for its gorgeous Blue Flag sandy beaches and thriving nightlife scene, Fuengirola is a firm holiday favourite with everyone, from couples to families. Whether you want to relax and unwind with long, lazy days on the beach, hit the dance floor by night and the pool by day, or explore the nearby sights, such as the Sierra Nevada mountains or the epic Alhambra Palace of Granada, Fuengirola has something for everyone. And we’ve put together a list of the best villas around, all with that special ingredient: easy access to the stunning Costa del Sol beaches. This beautiful villa is the epitome of Spanish style. White-washed walls, a terrace filled with colourful flowers, and a sparkling pool provide the setting for a fantastic family holiday. The golden sands of Torreblanca beach are just five minutes walk away, perfect for families who want to enjoy beach days with minimal stress. If you are in need of entertainment, the water sports, bars and shops of Fuengirola are just ten minutes’ walk, while a short drive will take you to zoos, water parks or historic sites. By night, you can enjoy an evening on your terrace with your very own stone BBQ, which is great for feeding the whole family with an easy and delicious meal. 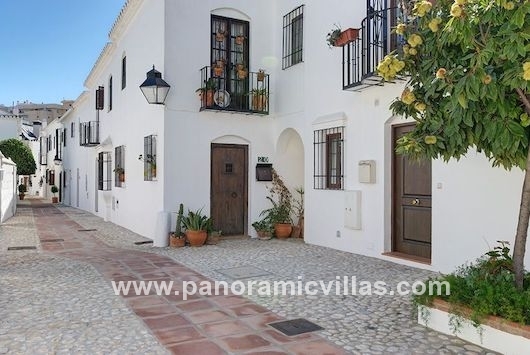 If you like the idea of being near to the action of town as well as the beach, this wonderful traditional townhouse could be the ideal choice. There’s no need to bother with driving, navigating or public transport, as all of Fuengirola’s shops, bars and restaurants are within easy walking distance. With two lovely, large air-conditioned rooms, this is a great choice for a holiday with friends or a fun-loving family. There is an attractive outdoor terrace and the beach is a mere five minutes’ walk away. If you love the style of a modern villa, this tasteful villa boasts a private pool, spacious rooms, all mod cons and, best of all, a stunning location just 150 metres from the beach. The clean, modern decor is finished to a great standard and the outside area is beautiful, with plenty to keep everyone entertained, from table tennis to BBQ-ing. For large groups or families, you can’t beat this enormous seven bed villa, situated just ten minutes’ walk from the sandy beaches of the Costa del Sol. With a private heated pool, gates for safety, and a gorgeous private garden, this is the ideal place to let the kids run free while you relax on a sun lounger with a good book. 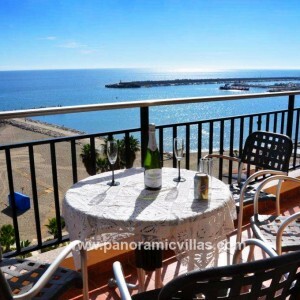 We also boast a range of spacious, family-friendly apartments in Fuengirola for you to choose from. This entry was posted in Costa del Sol, Fuengirola, Spain, Your Travel Advice and tagged Beaches, villa holidays on August 4, 2016 by Jess Whittle.